Stars dazzled on the Oscars red carpet 2013 Sunday night in Los Angeles, wearing shades of red and blue, along with neutral tones — and practically everything in between. Nominee Jennifer Lawrence arrived in a voluminous gown by Christian Dior, while presenter Reese Witherspoon made a bright appearance in Louis Vuitton. Anne Hathaway, who had husband Adam Shulman by her side, wore a pale pink Prada look for the big night, and performer Charlize Theron went white in Dior Haute Couture. Jennifer Garner, in a custom Gucci number, was there to support husband Ben Affleck and his best-picture contender, Argo, and also take care of her own presenting duties. Jennifer Aniston was also among the evening’s presenters and chose a bright red Valentino gown for her turn in front of the cameras. There are hundreds of red-carpet pictures, so click through to see them all, and make sure to vote on your fashion and beauty favorites! Kerry Washington’s wears fabulous coral Miu Miu dress. Adele wears Jenny Packham dress. Zoe Saldana wears fabulous Alexis Mabille dress. Charlize Theron wears Christian Dior Couture dres. Jennifer Lawrence wears Christian Dior Couture dress. Naomi Watts wears Armani dress. Jessica Chastain wears Armani Privé dress, Christian Louboutin shoes and Harry Winston jewelry. Amy Adams wears Oscar de la Renta dress and Moa jewelry. 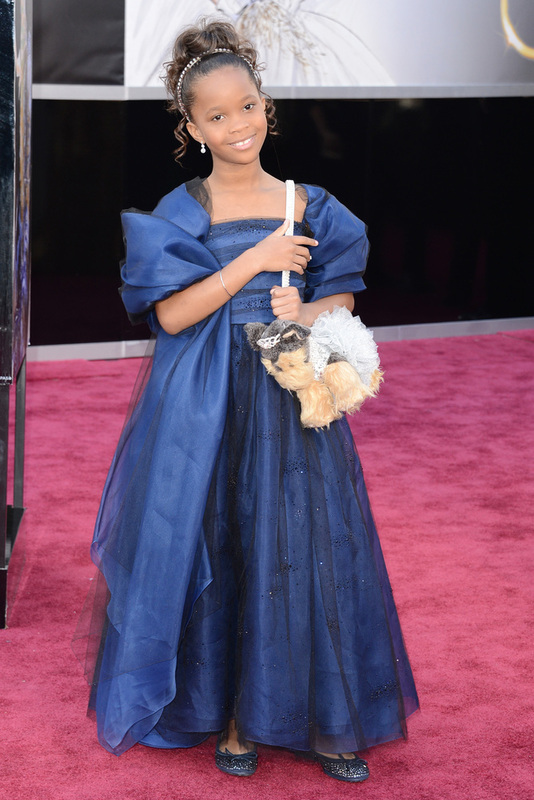 Quvenzhané Wallis wears Armani Junior dress. Amanda Seyfried wears Alexander McQueen dress, Roger Vivier shoes and Lorraine Schwartz jewelry. Halle Berry wears Versace dress. Kristen Stewart wears Naeem Khan dress. Jennifer Garner wears Gucci dress and Neil Lane jewelry. Renee Zellweger wears Carolina Herrera dress. Sandra Bullock in Elie Saab. Nicole Kidman wears L’Wren Scott dress and Fred Leighton jewelry. Salma Hayek wears Alexander McQueen dress. Jennifer Aniston wears Valentino dress. Olivia Munn wears Marchesa dress. Reese Witherspoon in Louis Vuitton. Stacy Keibler wears Naeem Khan dress, Giuseppe Zanotti shoes and Lorraine Schwartz jewelry. Sally Field wears Valentino dress. Jane Fonda wears Versace dress. Catherine Zeta-Jones wears Zuhair Murad dress and Lorraine Schwartz jewelry. 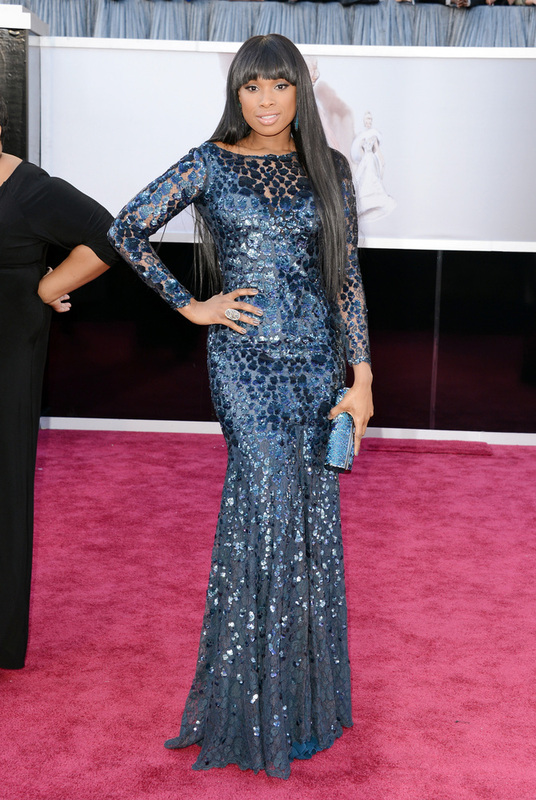 in a Roberto Cavalli dress, Giuseppe Zanotti shoes, Jimmy Choo clutch and Sutra jewelry. Kelly Rowland wears dress from Donna Karan Atelier.